I'm an ardent fan of Discovery Travel & Living & always on the channel following their travel & food shows. 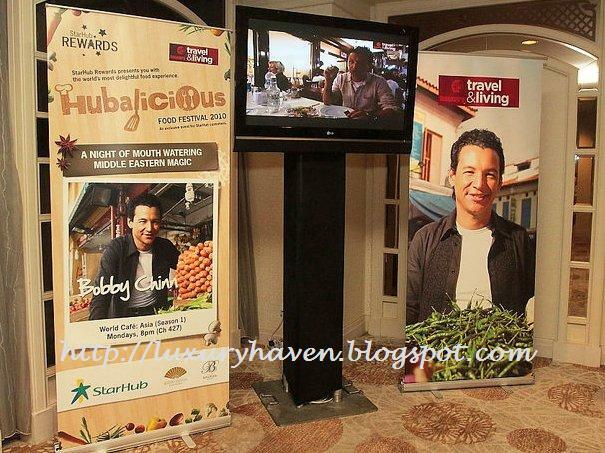 I was overjoyed when I learnt that I was going to spend a night with Celebrity Chef Bobby Chinn for FREE, while others have to fork out S$128/pax. Errr, don't get me wrong. I mean fine dine in a 5-star hotel, watch Bobby in action, bring along a partner..... all these for free!! Thank you Discovery Travel & Living, & Starhub, for the delectable surprise! 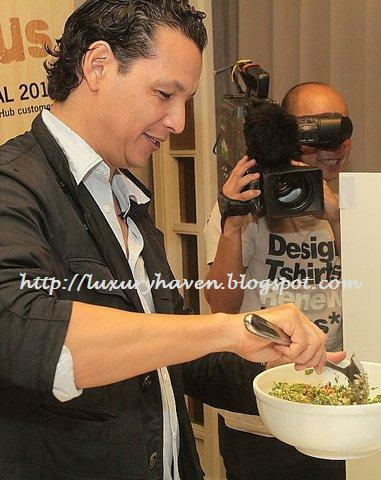 Named 'Best Entertainment Presenter' for Discovery Travel & Living's World Cafe Asia series, Bobby Chinn is one of the most dynamic global chefs, known for his French technique & a total disregard for tradition. I was thrilled, ready for some culinary magic @ the Mandarin Oriental Singapore. 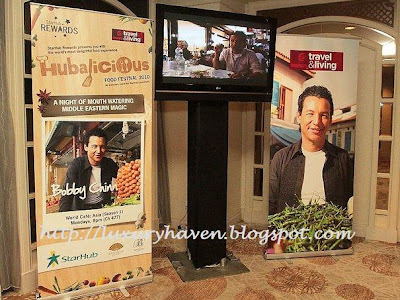 The Hubalicious Event began with the charismatic Chef entertaining us with his bubbly personality & charming cooking skills. He related his Middle Eastern adventure, walking through the markets of Istanbul & Damascus in search of unique tastes. Then Bobby demostrated his 1st rustic dish on the menu right in front of us. 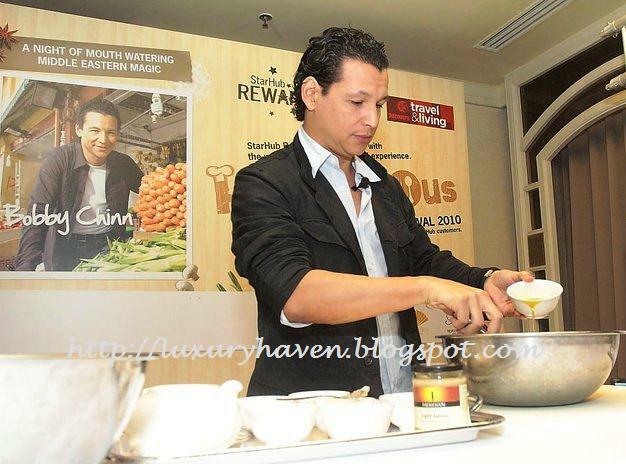 He whisked a Tahina Dip with cumin, sesame oil, olive oil, garlic & lemon juice. Next, he whipped out a roasted Egg-plant & chopped it up. He threw them into the dip together with some bell peppers & walnut. Added some sweet & sour sauce & tossed in pomegranate seeds. Viola, that's our 1st starter! Following that, Bobby showed us how to make Ganoush & Tabuli by using Bulgur Wheat & adding lots of vegetables. 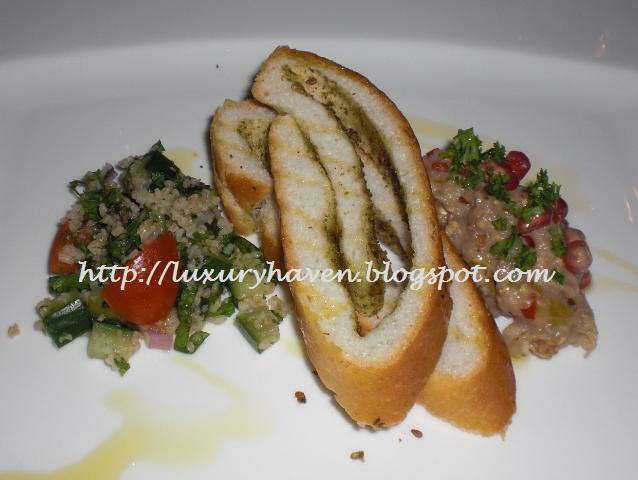 He used cucumber, onion, parsley & mint for this next starter. Tummy was growling & getting impatient when the Mezze Platter was finally served. We got to try what Bobby had just demonstrated - a classic Middle Eastern dips of Tahina, Baba Ganoush & Tabouli served with warm Pita bread. I could taste the smoky flavour of the roasted Egg-plant & I love the chewy Pomegranate seeds. An interesting combination indeed! The course was paired with Beringer Chenin Blanc, a Californian Collection. The Watercress Soup was a puree of Watercress & White Bean with a tinge of Fish Sauce. 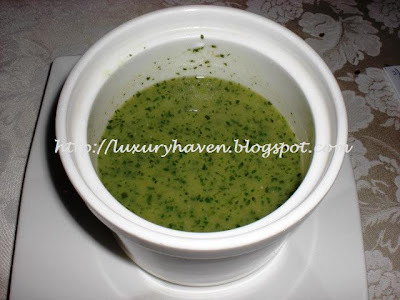 Soup was really good & I enjoyed every bit of the watercress, but a creamier texture is much preferred. A waiter came around to serve us the Beringer Merlot from the Founders' Estate, preparing us for the next course. Errr...... I can't comment much about the Main, which was Lamb. I'm embarrassed to say that I've never tasted lamb in my entire life. I guess the smell can be too over-whelming for my digestion. However, I was not alone over at my table of 10. There were couple of others, including my partner, who were either not into mutton or found the meat too rare. The waiter asked if we wanted something else, but only one accepted the kind gesture. The lady was a vegetarian. But of course, others were eating their hearts out. I offered mine to a lovely couple next to me & I could see they were more than happy to accept. Clearly, lamb lovers have enjoyed the dish. The Australian Rack of Lamb was dusted with Sumac spice, served with cabbage parcel of Truffle scented Cous Cous accented with Cumin and Lamb Jus. The delightful evening ended with the “Basbousa” - a Semolina Cake with fresh cream & roasted Almond. 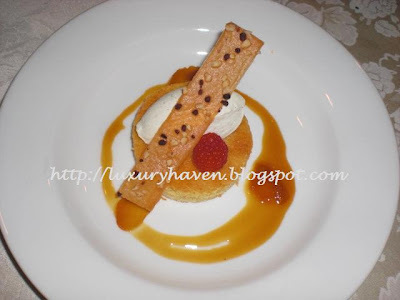 The dessert was paired with the Beringer Sparkling Wine. 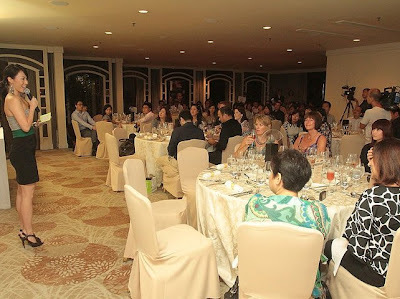 In between the courses, we were given wine talks & chances to win fabulous prizes. I was hoping to get a hand on Bobby's Cookbook but I wasn't lucky enough. Nevertheless, each & everyone was given a goodie bag. In it: an Apron & something to my delight - a Stainless Steel Electric Salt/Pepper Mill worth S$59.90! Hubby & I had a great time at the dinner, though "hungry" for more. Married for coming 20yrs, it's one of those dates we get to enjoy without our beloved son. As he was "Home Alone" that nite, we'd to wrap up soon after the dinner to be home with him. Now that I've met Bobby Chinn & Bob Blumer in person, next on my most desired wish-list will be Anthony Bourdain of No Reservations. 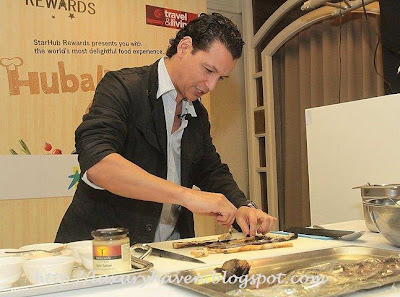 Check out my last cooking workshop An Evening With Celebrity Chef Bob Blumer! Wow, Wow! Looks yummy. But like you, i'm no fan of mutton too. But the dishes really looks tempting. And the stainless steel salt and pepper mills is indeed a great gift too! WOW! 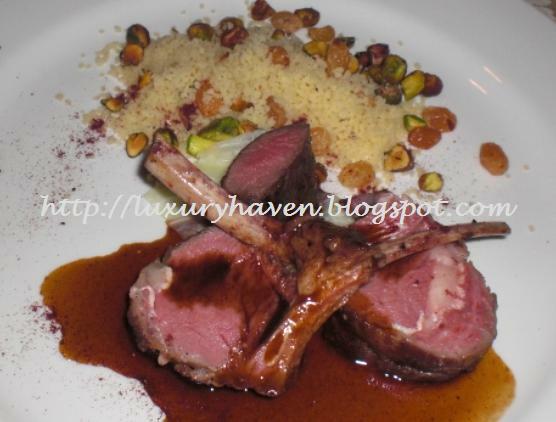 The rack of lamb was to die for! Definitely done to a perfect medium rare. I'm not one for cumin & cous cous but I reckon it would taste nice with truffle oil. Deli S, it's a pity I can't eat lamb but the S&P Mill was a compensation. LOL! Oh my goodness, Shirley, I am so jealous of you leh! hahaha.... Actually, your darling also not bad either. hehehe.... And you look absolutely gorgeous in middle. Woooo..... I'm sure you're having a fabulous time there enjoying the food. My Little Space, I know, I know, few of my friends were hoping to get into my guest list :) Thks, Kristy! M. Spice, u're a vegetarian? Was it for health or religion? I like that pix too :) Thks, Alisha!